Live it! 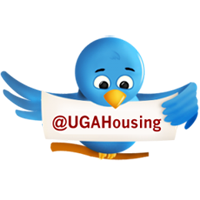 UGA Housing: New Updates from RHS! Residence Hall Studios (RHS) is pleased to announce that it is now an official student organization with our own constitution. For the past three years RHS has produced segments to run on the housing television channel-12. RHS stems from the Residence Hall Association (RHA) and we are excited about our new chair on the RHA executive board for the 2012-2013 academic year. In the future, we hope to strengthen our relationship with RHA and the National Residence Hall Honorary (NRHH) at UGA. This semester has been a busy and very productive one for our members. We have completed more projects this semester than any previous semester. We are proud to be able to show our families and friends all of our hard work on the new RHS YouTube page! Some of our projects this year have included: Sh*t Bulldogs Say, Wallace (a short, student written film), and ECV’s Got Talent. RHS is always looking for new members who want to learn more about filming and broadcasting. Whether you want to act, be a part of our production team or enhance your skills in video editing our doors are always open. We are located outside of Creswell hall next to the RHA office. RHS meets every Wednesday in the studio at 6 p.m. See you there! Megan Harragan is a third-year Psychology major and the Business Director of Residence Hall Studios. She joined RHS after being actively involved in theatre during high school. Welcome to the Live It! UGA Blog! University Housing is at the center of the campus life experience at the University of Georgia. This blog keeps our residents up to date with news, programming and events happening in the residence halls. Our writers are also here to share stories and offer advice to residents as they experience UGA while living on campus. University Housing reserves the right, but is not obligated, to remove comments that contain commercial solicitations; are factually erroneous/libelous; are threatening or harassing in nature; are wildly off-topic. © University Housing, 2012. Picture Window theme. Powered by Blogger.